1. Take the lead. There’s a great dichotomy that has developed in medical imaging—while there’s an undertone of uncertainty in the US due to a variety of environmental factors, leading imaging organizations are moving forward seizing the opportunity to differentiate and separate from competitors. As legacy PACS have aged, no organization has coveted upgrading or replacing ‘PACS with PACS’ for negligible gain; however, times have changed. Whereas conventional solutions offer competitive parity, leading organizations have recognized that Visage 7, independently or in combination with other best of breed solutions, offers dramatic step-change improvements that leapfrog the status quo. While some lessor competitors are strategically comatose, top organizations have decided to break from the pack and move ahead. Michael Gray was arguably the first to write about this strategy following RSNA 2013, and Joe Marion followed it up this year. 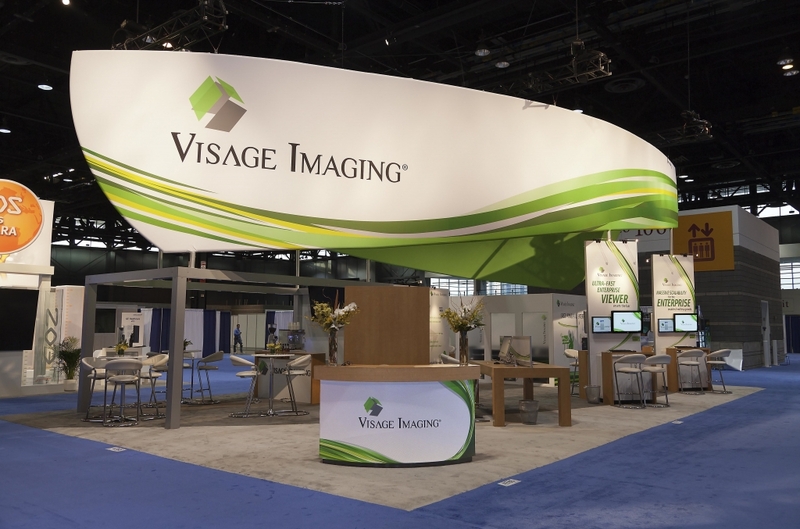 It was fantastic to see so many of the industry’s largest and most prestigious institutions spend time with Visage at RSNA! 2. Opportunity in EMR and consolidation. Many organizations have spent hundreds of millions of dollars (or more) for EMR implementations. 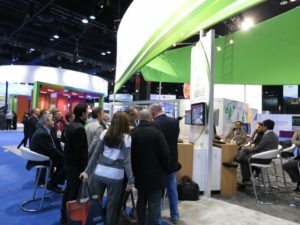 For mere fractions of that expense, administrators and diagnostic imaging leaders are arguing the merits of enterprise imaging strategies that leverage the EMR as a single point of access. A cohesive workflow for imaging results access for referring physicians, and for some EMRs who offer RIS functionality, a unified interpretation workflow for radiologists. Other systems are growing through traditional M&A, and/or pursuing revenue stream growth through service offerings that leverage the technology strengths of the organization. 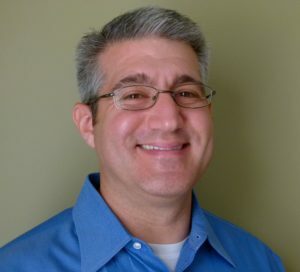 They envision providing imaging as a service to community care providers who have fallen behind in their imaging capabilities and also do not have IT as a core competency. 3. To merely display or generate. Astute industry observers have recognized that traditional PACS merely display images, while enterprise imaging viewers like Visage 7 generate new images and valuable clinical data. Some examples of clinical work products that add value are the data resultant from PET/CT RECIST lesion tracking, coronary calcium scoring, etc., that need to be ‘freed’ for downstream access. Increasingly, organizations are seeking to incorporate data generated during interpretation, in the form of DICOM SR, automatically into the formal radiology report via reporting solutions. 4. Revolutionary, but not so scary DBT. Earlier this year, one of the closing sessions of SIIM 2013 highlighted the challenges of reading digital mammography on PACS, as well as the promise and fear of digital breast tomosynthesis (DBT) ‘killing’ PACS. Many of the luminaries at the meeting repeated the call for server-side processing as the best architecture to deal with the massive size inherent to DBT studies. For example, display of a DBT study (without priors) includes 6 GB of data (e.g., 1.5 GB per image, per view, per breast). Yes, the size of DBT studies are measured in gigabytes, not in tens or hundreds of megabytes as with other imaging studies. 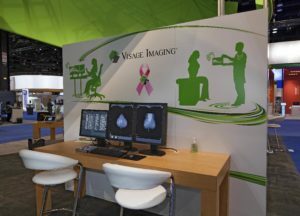 Visage was a proud sponsor of the DBT forum, and was the only vendor discussing server-side processing as their current architecture for breast imaging and all other diagnostic modalities in a single platform. 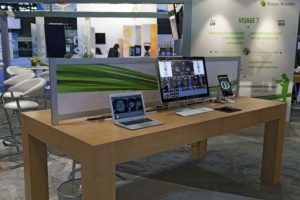 At RSNA, Visage demonstrated work–in-progress improvements to Visage 7 reading workflow for DBT, additional navigation and manipulation tools, as well as the ability to rotate and target on the lossless 3D DBT MIP. The magic of server side processing displays the DBT study, complete with hanging protocol and study layouts in 2-3 seconds over the LAN, without any data cached locally or need for pre-fetch. Similar speed and performance is even attainable over the WAN, down to broadband network speeds of 6 Mbps. 5. Strategy reset. Many organizations have rushed to implement archive neutral viewers (ANVTM) or UniViewers integrated to their EMRs and VNAs, only to receive disappointing feedback from physicians due to watered down viewer capabilities and poor viewer performance. This strategy has perpetuated the problems of the early days of PACS, where one caliber of viewer was provided to radiologists, and another lesser caliber viewer was provided to everyone else. This created a problem of the ‘haves’ and the ‘have-nots’, often sparking a culture war between physicians, putting IT right in the middle of the fight. 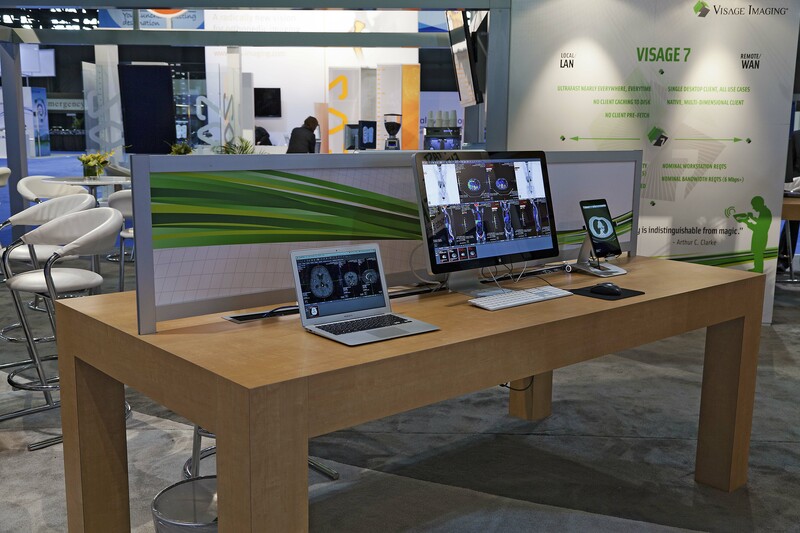 Once organizations learn that the Visage 7 viewer can flexibly accommodate all use cases, including interpretation and EMR image enablement, with a single powerful viewer, that fundamentally changes all of their perceptions of what is possible. The door is then opened for transformational change in imaging, not the incremental benefit of just providing images from the EMR. At RSNA 2013, many organizations were actively dialoging about their changing, yet maturing strategies. With exciting change on the horizon, 2014 looks to be a fantastic year indeed! On behalf of all of our colleagues at Visage Imaging, we hope you have a happy and healthy holiday season! 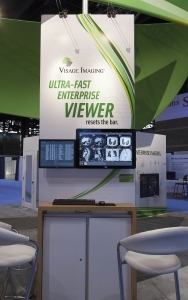 *RSNA 2013 Review, December 2013, by Nadim Daher, Principal Analyst, Medical Imaging and Imaging Informatics, Frost & Sullivan. For more information about this report, please contact Jennifer Carson, Director of Corporate Communication.